‘Mother of vinegar’ is an affectionate term given the gelatinous, opaque content found in raw, unpasteurized vinegar. Its Latin name Mycoderma aceti means ‘skin of the acid.’ Composed of cellulose and Acetobacter aceti bacteria, mother develops on fermenting alcoholic liquids. Mother&apos;s components convert alcohol to acetic acid creating vinegar with its unique tart flavor and zesty bouquet. Mother of vinegar contains very friendly bacteria similar to sourdough starter and they are the main reason ‘raw’ vinegar has such a powerfully healthy reputation. Why do so few Americans know about the wonderful external and internal efficacies attributed to good quality raw vinegars? Is it because traditional, commonsensical wellness care has been suppressed by being unethically discredited? Do special interest societal elements like pharmaceutical drug makers, agribusiness, doctors, hair, skin, and body care product and cosmetic makers collude to hide simpler, safer, more ecological, and less costly options? Certainly, it is best to be discerning when we are availed of all relevant information, not merely the loudest sources. Even cursory investigations reveal knowledge so surprising that it is hard to believe, but the verified variety of raw vinegar health benefits and utility continues to amaze us. Authentic vinegar contains many beneficial organic acids, bacteria, enzymes, and phytonutrients. Research is only beginning to explain the extensive anecdotal evidence of vinegar&apos;s ability to promote overall health, evidence of which has been historically recorded for far more than 10,000 years. Organic EDEN Apple Cider Vinegar and EDEN Red Wine Vinegar are raw, unpasteurized, and traditionally crafted with no additives or processing aids. Their color, fruity bouquet, and smooth rich taste are only achieved through the finest ingredients, artisan skill, and the patient, tended aging that mellows it. When mother is present in raw vinegar like EDEN Apple Cider Vinegar and Red Wine Vinegar, it is an indicator of values that provide health and wellness benefits and help us to maintain an appropriate acid/alkaline balance. The heat of pasteurization and some types of filtering remove mother from vinegar. It is wise to carefully choose a vinegar for food and for body care. What it is made of and how it is made, make a tremendous difference in flavor and usefulness, especially in health benefit value. The Internet is an easy way to learn about the many healthy blessings of good vinegar. While today&apos;s white vinegar is an excellent household cleaner, it defies being described as a food. It is usually concocted from the petrochemical by-product glacial acetic acid, and so expresses only an acetic acid similarity to good-food vinegar. Superior chefs insist on a traditionally brewed vinegar such as an EDEN vinegar. Organic EDEN Brown Rice Vinegar is made using methods that have remained unchanged for over one thousand years. Organic brown rice, koji Aspergillus oryzae, and mountain spring water are mixed in earthenware crocks that are partially buried outdoors, covered, and allowed to ferment for about eight months to create a vinegar with a precious, sweet, smooth, and mellow flavor. Rare today, authentic brown rice vinegar like Eden&apos;s is a highly valued health food in Japan. Its sweetness is a culinary delight and enhances foods. It is essential in making good sushi. Modern rice vinegar is made of cheap, synthetic acetic acid, toxic caramel color, refined sugar, GMO starter enzymes, and chemical additives. EDEN Ume Plum Vinegar is the pickling brine from making umeboshi pickled plums. It has 4.3% acidity and is salty. This blend of organic acids and pickling brine has been used in Japan for thousands of years to flavor and preserve food. Its native name is ume su or plum vinegar. Its ruby hue is from red shiso leaves, Perilla frutescens or beefsteak leaves. EDEN Ume Plum Vinegar contains absolutely no additives. It carries forward ancient wisdom, phytonutrients, and efficacies that have made ume su brine vinegar so famous. Commercial versions of umeboshi are colored red with a toxic dye. All EDEN vinegars are bottled in dark amber glass to protect their flavor, nutrients, and beneficial characteristics. Amber glass greatly reduces the deleterious effects of light caused photo-oxidation and the associated chemical changes of phytonutrients. Light induced chemical change in food leads to discoloration and off-flavors. Ambient light caused photo-oxidation is systemic in retail stores where particularly damaging fluorescent lighting is so common. Plastics, most of them, adulterate and add flavor to food. Amber glass is more difficult and costly to obtain, but it best protects food from light rays, and best protects overall food quality. 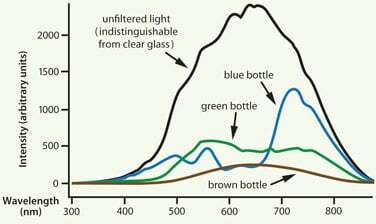 Light Absorption of Glass - Brown absorbs most and protects better than blue or green glass. Eden uses brown glass bottles to prevent light-induced damage to nutrients, flavors, and color. It also maintains purity.